Just Be Good for Goodness Sake | Just Be Good for Goodness Sake – The Republic of T.
I saw this ad on the DC Metro this week, and wanted to blog about it, but hadn’t had time until now. And just in time for Xmas. Has anyone alerted Bill O’Reilly yet? If you sometimes find yourself praying for a seat on a crowded Metrobus, some atheists have a message for you: Don’t bother. At a news conference at the National Press Club yesterday, members of the American Humanist Association — one of the country’s leading atheist and agnostic organizations — explained what they’re up to. Giving up your seat for a pregnant woman? Ethical. Eating a french fry in a Metro station? Unethical. Holding a Metro train’s doors open until they break, thus forcing everyone to be offloaded? Stone him! The atheists said they aren’t trying to proselytize — a funny concept — just reaching out to what they say is an increasing number of people who do not believe in a deity. Honestly, when I saw the advertisement, I got a huge smile on my face. Why shouldn’t someone stand up for the notion that you don’t have to believe in a god to be good? I’ve no particular desire to become a Nazi, I hope you understand. And apart from some idealistic adolescent posturing – look, I liked the badges and I was young – I’ve never had much time for Communism. But as one leading Irish religious commentator pointed out recently, anyone who doesn’t believe in God will eventually succumb to some evil and discredited ideology. Yup, all of us out there who are proud to call ourselves atheists are simply deluded fools who will ultimately allow ourselves to become in thrall to some evil belief system because we don’t have God to help us resist the lure of the jackboot. It’s an interesting argument on many levels, not least the obnoxious presumption involved. After all, the spread of Nazism throughout Europe was eased by its close association with many religious leaders. From where does an atheist draw his or her morality? There’s a widespread view that somehow atheists are not able to be moral or they are less moral than others. It’s a really deeply confused prejudice. There are billions of people in China and India, for instance, who do not believe in any sort of western monotheistic God of the Bible, Quran or Talmud. Does the person who thinks nonbelievers are immoral want to say that out of all of those billions of people, not a single one of them is a decent, moral human being? Of course not. On second thought… No, wait. You don’t. The idea that atheists have no reason to be moral without a god or religion may be the most popular and repeated myth about atheism. It comes up in many forms and all are based on the assumption that the only valid source of morality is a theistic religion, preferably the religion of the speaker which is usually Christianity. Thus without Christianity, people cannot live moral lives. This is supposed to be a reason reject atheism and convert to Christianity but the argument fails because contrary to the beliefs of theists, their god and their religion are not needed for morality. Nope, definitely not. You don’t. You worried that atheists have no compelling answer to a person who says, “I’m going to do whatever I please.” But religion does not solve that problem. If anything, the problem is far worse when the malcontent is a theist who claims that his desires are not just some idiosyncratic expression of individual preference, but the very will of God. An atheist, at least, has no warrant to claim holy sanction or divine infallibility for his opinions, and in theory can be persuaded by reason. On the other hand, a person who sincerely believes that they are acting in accordance with the will of the creator is immune to evidence, diplomacy, and compromise – as the many religious wars still smoldering after millennia should make abundantly clear. In your column, you said that morality cannot be anchored without reference to a higher power: that if God had not commanded us to be good, we would have no reason to be good, and no justification for condemning those who were not. This claim betrays its own incoherence, for we can then ask, why does God command us to be moral? Does he have reasons for that edict? If so, then we too can make use of those reasons, for if they are good ones, they will stand on their own without reference to who is giving them. On the other hand, if God has no reasons for his commands, then religious morality is cut loose from any anchor. God commanded us to be merciful and kind, but that was just an arbitrary choice with no deeper significance. He could just as easily have commanded us to be vicious and cruel, and those traits would then be the definition of goodness which we were all bound to follow. Can any rational person accept such a nonsensical conclusion? You asked what reason an atheist can give to be moral, so allow me to offer an answer. You correctly pointed out that neither our instincts nor our self-interest can completely suffice, but there is another possibility you’ve overlooked. Call it what you will – empathy, compassion, conscience, lovingkindness – but the deepest and truest expression of that state is the one that wishes everyone else to share in it. A happiness that is predicated on the unhappiness of others – a mentality of “I win, you lose” – is a mean and petty form of happiness, one hardly worthy of the name at all. On the contrary, the highest, purest and most lasting form of happiness is the one which we can only bring about in ourselves by cultivating it in others. The recognition of this truth gives us a fulcrum upon which we can build a consistent, objective theory of human morality. Acts that contribute to the sum total of human happiness in this way are right, while those that have the opposite effect are wrong. A wealth of moral guidelines can be derived from this basic, rational principle. Atheism is not a worldview. It doesn’t carry any obligation to any kind of political or moral system. In that sense, it is amoral. Note that it is amoral, not immoral. Immorality is flouting the conventions of one’s own morality; amorality is being without morality. You would be justified in asking, then, if this means that in practical terms that Atheists have no morality. The answer is, of course, that Atheists can and do have morality and ethical codes. What the amorality of Atheism entails is a lack of obligation to any system of morality. An Atheist can have any system of morality he or she wishes. Why should an Atheist be moral, without a god to make him to do so? You may as well ask why he should use his head for something besides a mobile hat rack. Morality is a built-in condition of humanity; the moral tendency exists in just about everyone, barring psychopaths. That last part of the argument has always bugged me. Are the people who say you can’t be good without believe in a (read their) god also saying that the threat of eternal damnation is all that stands in the way of their going on a psychopathic murderous rampage? Here’s another example that ought to be food for thought. It’s always amusing to listen to people who dress up their homophobia as a harmless and non-judgemental expression of their faith. So here’s a little test: a man refuses to rent a room to a gay couple because, while he isn’t judging them, his faith has strict and clear guidelines on how to treat homosexuality. In another hotel, a man refuses to rent a room to a gay couple because, he says, he hates fags. Which of the two is more morally reprehensible? Answer: they’re both the same. For all the moral posturing of the smugly religious against those of no religion, one fact stands out – at least we have to back up our arguments with something approaching a coherent thought process. But maybe part of the point is to let people know they’re not alone. A group of atheists and agnostics has rented a billboard along the New Jersey Turnpike to trumpet what it says is a seldom-heard message in 21st-century America. “Don’t Believe in God? You are not alone,” the 48-foot-wide sign says. The message went up on Saturday. It will remain in place until Feb. 3, according to a spokesman for the American Humanist Association, which organized the effort. The billboard is along Route 95 south in Ridgefield, just before the turnpike splits into two spurs. “This billboard represents that there’s another viewpoint and that it’s time we spoke up,” said the spokesman, Fred Edwords. Apparently, there’s a need, or at least a demand. Good morning. I’m Jan Meshon, president and founder of FreeThoughtAction, an adjunct of the American Humanist Association (AHA). FreeThoughtAction (FTA) uses traditional marketing and modern communications to raise the visibility and acceptance of the large and growing freethought community throughout the United States. I am thrilled to be here today to help launch the American Humanist Association’s new advertising campaign on Washington D.C. buses. …The first billboard generated a few news stories, including on the front page of the Bergen Record, the large suburban newspaper in that area. It was also the lead story on their web site. Dozens of blogs covered it. We received hundreds of e-mails from around the country, almost all of them in support of the ad. People told us how proud they were to see their point of view so publicly displayed. Contributions came in from around the country. At this point people from more than half the states have chipped in to support more billboards. The second billboard had even more impact. Several established freethought groups in Philadelphia came together to form PhillyCoR, the Greater Philadelphia Coalition of Reason. 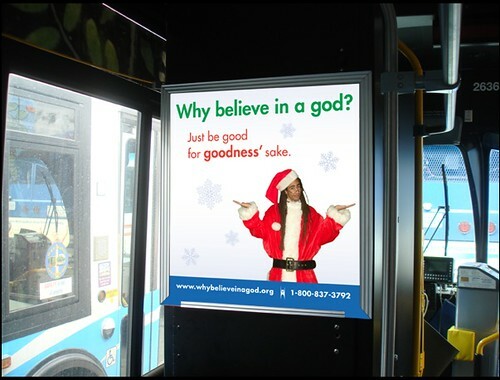 Groups that existed under various nontheistic terms like “atheist,” “freethought,” “humanist” and “secular” pulled together to run the ad jointly under a common name. This time the billboard flew high above I-95 just north of Philly’s center city. The Philly ad was covered in many of the local city and suburban papers, including the Philadelphia Inquirer. It was the lead story on the Philly.com web site where over 70% of 10,000 participants in an online poll said they don’t believe in God. It was also covered on local news and talk radio and a hilarious report on Fox News Channel wherein they gave it the old “fair and balanced” treatment. Watching the Fox story you would be led to believe that God-fearing Philadelphians had gathered with pitchforks and torches demanding that the billboard be taken down. Truth is, aside from a dozen or so e-mails and phone calls, of varying sincerity and friendliness, warning us of spending eternity in hell, there was much discussion but little negativity. On the other hand, it inspired hundreds of fellow freethinkers to call, write, donate, come to a meeting or join one of the local participating groups. Since then, the billboard has appeared in Los Angeles and Kansas City and is about to go up on several boards in the Denver and Colorado Springs areas in association with COCORE, the Colorado Coalition of Reason. Meanwhile, plans are being put together to launch a united national coalition under which to do joint promotion in many more markets in 2009. I know I smiled when I saw the ad. It felt like a breath of fresh air, during a season when, if you’re someone who doesn’t share the dominant faith, you’re basically looked upon as having something terribly wrong with you. And only one group seems to own the public square. In Washington, the humanists’ campaign comes as conservative Christian groups gear up their efforts to keep Christ in Christmas. In the past five years, groups such as the American Family Association and the Catholic League have criticized or threatened boycotts of retailers who use generic “holiday” greetings. In mid-October, the American Family Association started selling buttons that say “It’s OK to say Merry Christmas.” The humanists’ entry into the marketplace of ideas did not impress AFA president Tim Wildmon. Also on Tuesday, the Orlando, Fla.-based Liberty Counsel, a conservative Christian legal group, launched its sixth annual “Friend or Foe Christmas Campaign.” Liberty Counsel has intervened in disputes over nativity scenes and government bans on Christmas decorations, among other things. And that’s always the reason nonbelievers are supposed to keep quiet. Maybe that’s changing, finally. We just finished a presidential election in which the winner manage to pull off a victory without substantial white evangelical support. This after how many elections during which while evangelicals were about the only votes both parties went after like they were all that mattered? I hope this is the beginning of greater participation in the public square and discourse. A “coming out,” if you will. Bill O’Reilly may not have heard of it yet, but Don Wildmon has. Predictably he’s rending his garments over how we’re persecuting Christians and advocating the destruction of society.